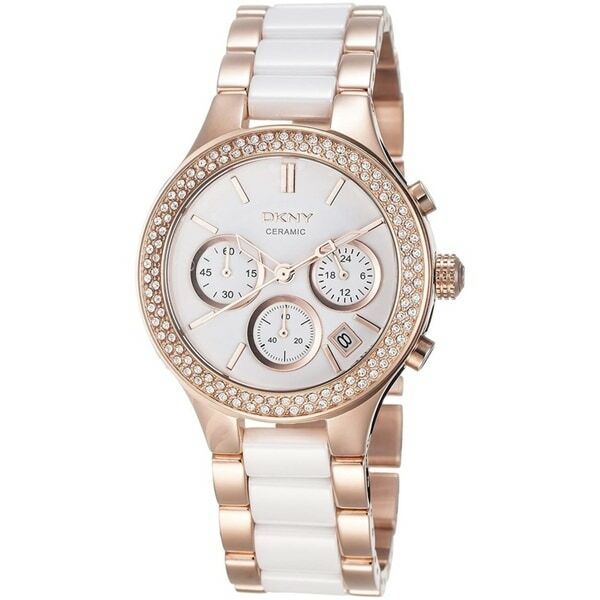 Rose gold stainless steel case and bracelet with white ceramic center links. Crystal accented bezel. White dial with rose gold hands and index hour markers. Date display between 4 and 5 o'clock positions. Three sub-dials displaying 24 hour, 60 minute, and 60 second. Quartz movement. Mineral crystal. Push/pull crown. Case: diameter 39mm thickness 12mm. Band: width 20mm. Pushbutton clasp. Water resistance at 5 ATM. Functions: hour, minute, second, date, chronograph. All measurements are approximate.